Senior care businesses are some of the best franchises to open and own—for one simple reason. We’re all aging and we all have aging loved ones. Right now, the large Baby Boom generation is beginning to rely on A Place at Home senior services, and the market will grow from 56M seniors to 84M in a 30 year span. In addition, owning such a franchise can fulfill a desire to help your community. These are great upsides, but you can’t count on “just any” run-of-the-mill senior care franchise to flourish. The best franchises to open will make themselves market leaders. Make your franchise choice wisely, by looking at what sets the best senior care franchises apart. The problem with most senior care franchises is their narrow focus. If you invest in purchasing one of the very narrowly-specialized senior care franchises (those that only do non-medical, in-home or companion care, for example) your group of potential customers is very limited. A narrow, limited scope franchise in today’s highly competitive market may not stand out. “One-size fits all” single-service franchises are not the most effective for senior care. Most seniors need a custom solution, with services tailored to their current needs and future plans–that’s exactly what A Place at Home franchises offer: more diversity amongst service lines, with phenomenal franchisee training in how to streamline the services. We created our A Place At Home franchise around multiple lines of service. This answers the great, unmet need in the marketplace. Seniors, and their busy caregiving family members, need a customized care solution. Our franchise owners can offer packages of services, unique to each senior’s individual situation. Our full-service franchise offers seniors a trusted and convenient, one-stop place to get an accurate assessment of their needs. Then, our senior care coordinators arrange for, and connect them with, all the care they need now, and outline a plan for future needs from our suite of senior care services. A Place at Home stands out from all the other, single-focus “home care” franchises. With our 4 lines of services, our franchisees can create customized plans to meet each senior’s needs. We are flexible and multi-faceted, in contrast to typical, single-service franchises. With the single service franchises they are forced to recommend other companies to do what A Place at Home can do for the senior. This does two things: 1) you just gave away the revenue and 2) the most important, you just introduced another provider to the client. Our goal is to streamline the aging process by decluttering the amount of providers and manage the situation for them, thus creating a superior service for the senior population. Our competition has said, “A Place at Home offers too much! We (the competitor) focus on one service, home care, and do really great at it.” Our rebuttal is this “A Place at Home focuses on one service as well: fulfilling the needs of each senior client and family. 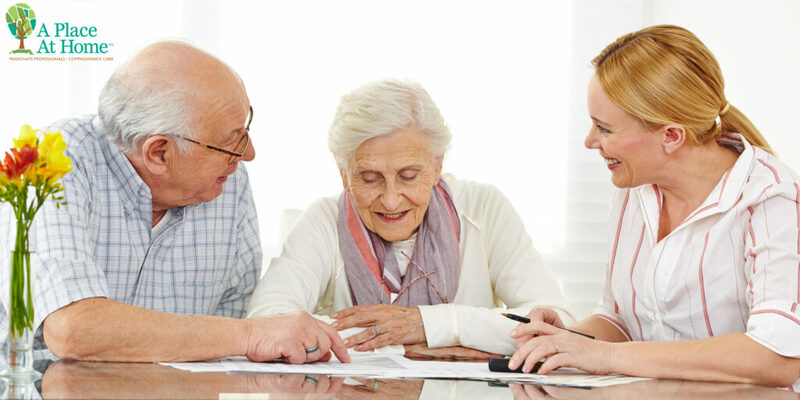 We focus on the whole person, providing the best option(s) for each unique senior and situation. Our wide-ranging, custom senior care program drawn from 4 lines of service, provides superior options for seniors–and multiple revenue streams for our franchise owners. In a saturated senior care market, we are proud to offer something truly outstanding. What sets us apart is our deep understanding of the continuum of care a senior may require. This innovative mindset makes us a winning franchise–that will outlast all the rest. Our senior-focused care model takes senior services to a higher level than other franchises in the senior care space. When you invest in a senior care franchise, pick the innovative franchise that offers multiple service lines to sustain your business. A Place At Home is poised for rapid growth. Now is the time to join us as a franchisee, with large, prime territories available. Take the next step now. Contact A Place At Home franchise today – 888-502-6310.